I was home when the spoilers got released so I knew immediately that I had to get the two oversized coats. Unfortunately I had to leave before the official release (I forced my sister to check regularly for the release and buy me these two coats so I wouldn't miss them) so I didn't have the change to try on the other pieces. After seeing them now, my only regret is not buying the "Sequin Trousers W Blazer" as well, but now it's too late. I love the whole presentation of the store. They have kept the same aesthetic with the previous collection, clean lines, basic colors and a mix of casual and streetstyle items. One more thing I like about this store is that the basic pieces are limited but still reasonably priced. My two purchases, the "Charcoal Streetstyle Overcoat" and the "Tan Streetstyle Overcoat" even though they don't change the pose of the doll, are two excellent pieces. From the rolled up sleeves to the masculine style, everything is right on trend. 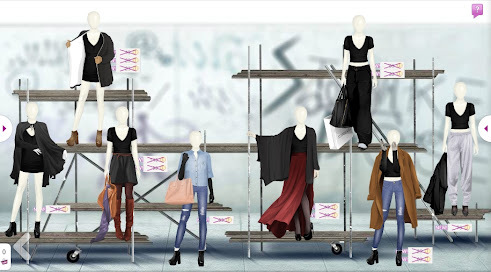 Plus an oversized, thrown over shoulders coat can come in quite handy on Stardoll, especially if you use the resize glitch and you want to hide some awkards parts. I just didn't like the way the sparkly trousers with blazer looked on my medoll. I almost bought it--got two others instead. I also bought the black deep-necked tee shirt.